These Stainless Steel Rods are generally stocked in 3 metre long lengths and we cut them down to the size as requested by the buyer. We offer each individual size of Grade 303 & Grade 304 Stainless Steel Bar in a whole host of handy lengths, starting from as little as 15mm long! We then offer you a free cut so if you need a length of 50mm Dia 304 Stainless Rod that is 585mm Long, you only pay for the nearest length offered (In this case it would be 600mm) and we will cut it back to 585mm at no extra cost – saving you money on what would otherwise be wasted material. Stainless Steel Round Bars have many great attributes. They are hard, strong, and have excellent anticorrosive properties. Grade 304 is the most popular grade of Stainless Steel. These round bars are easily TIG, ARC & MIG welded and they can also be brazed. Although Grade 304 is not the Free Machining grade of Stainless Steel (Grade 303 is best suited for machining), it can be machined under the correct conditions. Sharp tools are required, and correct speeds & feeds are very important – taking care to ensure that cuts are deep enough to clear the surface is a must, as excess contact will work harden the material. The attributes mentioned above make Grade 304 Stainless Steel Rod a fabricators favourite – often used in the manufacture of security grills, frames, tools, shafts, gears and items as required by the construction industry. 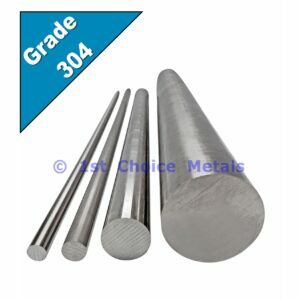 The other advantage of Grade 304 Stainless Bar against Grade 303, is that it is very slightly harder and also has better anti corrosive properties. Because of this, Grade 304 Stainless Steel Bar is heavily used in the manufacture of fasteners & fixings such as nuts, bolts, washers, clips, fittings & clamps. Items in the fastener industry that are manufactured from Grade 304 Stainless Steel are often referred to as “A2”.